And now it is time to don my "MAKE AMERICA GREAT AGAIN" ballcap and hit the streets! U.S. consumers don't have to dress up for Halloween—they're already superheroes of the 2016 economy. A number of economic factors are helping the consumer this year, and a new report from IHS Global Insights highlights how the amount expected to be spent on Halloween candy is a perfect symbol of that strength. "Overall, real consumer spending has been relatively strong since last Halloween due to modest consumer price inflation, low gasoline prices, better employment opportunities, and improved household finances," Chris Christopher, IHS Global Insights' director of consumer economics points out. The team expects spending on Halloween candy to experience the strongest increase since 2011, rising 5.5 percent and hitting $3.8 billion. In 2014 and 2015, spending on Halloween candy was up 5 percent and 1.7 percent, respectively. 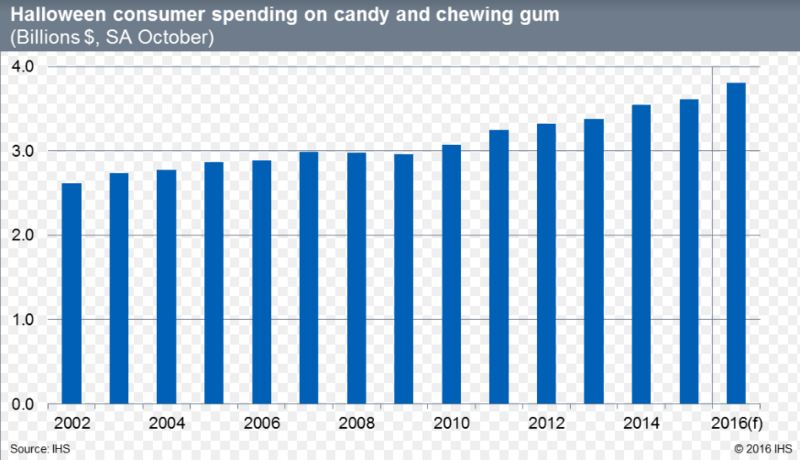 The report defined spending on Halloween candy as estimated October personal consumption expenditures, seasonally adjusted, on candy and chewing gum. The additional spending isn't due to an increase in the prices of Halloween candy, either, as those are expected to decline for the first time since 2013. Actually, I can't decide between my MAGA or Crooked Hillary ballcap. Affiliations listed for identification purposes only. Individuals listed are speaking only for themselves and not for their affiliated agency. "A Little-Noticed Fact About Trade: It’s No Longer Rising"
The growth of trade among nations is among the most consequential and controversial economic developments of recent decades. Yet despite the noisy debates, which have reached new heights during this presidential campaign, it is a little-noticed fact that trade is no longer rising. The volume of global trade was flat in the first quarter of 2016, then fell by 0.8 percent in the second quarter, according to statisticians in the Netherlands, which happens to keep the best data. The United States is no exception to the broader trend. The total value of American imports and exports fell by more than $200 billion last year. Through the first nine months of 2016, trade fell by an additional $470 billion. The economist Branko Milanovic published a chart in 2012 that is sometimes called the elephant chart, because there is a certain resemblance. It shows real incomes rose significantly for most of the world’s population between 1988 and 2008, but not for most residents of the United States and other developed countries. The chart is often presented as a depiction of the consequences of globalization. The reality is more complicated, but perception is undeniable. Voters in developed nations increasingly view themselves as the victims of trade with the developing world — and a backlash is brewing. Donald J. Trump’s presidential campaign is an obvious manifestation, as is Hillary Clinton’s backing off from her support of the Trans-Pacific Partnership trade deal. A study published in April found that voters in congressional districts hit hardest by job losses are more likely to reject moderate candidates, turning instead to candidates who take more extreme positions. Economic stagnation is turning European voters against trade, too. Iceland’s prime minister announced on Sunday that he would resign, as the insurgent, anti-establishment Pirate Party capitalized on a wave of anger over corruption to come in second place in the country’s general election. The conservative Independence Party, which has been in a governing coalition with the Progressives, came in first with 21 seats, up from 19 in the last election. But the big winner in the election on Saturday was the four-year-old Pirate Party, which took 10 seats, more than tripling its showing of three seats in the last general election. The Left-Green Party also won 10 seats. The left-leaning parties — the Left-Greens, the Pirates and two allies — won 27 seats over all, just short of a majority. The liberal Regeneration Party, which is expected to play the role of kingmaker, has ruled out joining a coalition with the current governing establishment parties. This means that left-leaning parties could potentially form a governing coalition. People who live in glass houses post title: I'll take Iceland more seriously when their politicians start acting more like grown-ups. [Watauga County] Commissioners heard from High Country Recreation representative Dr. Scott St. Clair and ASU economics professor John Whitehead about the economic benefits of a recreation center. The presentation indicated that a recreation center could generate a $36 million dollar impact on the local economy and there is a 90% chance that the benefits of such a facility would outweigh the costs. Here is a summary of the report prepared by members of the App State Student Chapter of the National Association for Business Economics: https://business.appstate.edu/news/proposed-recreation-center-infuse-money-economy-create-other-benefits-high-country. Top-ranking economists sometimes publish papers in open access journals deemed potentially “predatory,” according to a new analysis. The findings contradict previous results that show that researchers who publish papers in “potential, possible, or probable” predatory journals (as defined by librarian Jeffrey Beall) are largely inexperienced. According to the study, 27 of the most eminent economists (within the top 5% of their field) have published nearly 5% of their papers in predatory journals. These researchers published 31 papers in predatory journals in 2015 alone. The finding — which is not yet peer reviewed — comes as a “big surprise,” co-author Frederick Wallace of the Gulf University for Science and Technology in West Mishref, Kuwait, told Retraction Watch. At the end of last year, Wallace and Timothy Perri from the Appalachian State University in Boone, North Carolina noticed that 39 predatory journals were listed on the database Research Papers in Economics (RePEc). After some digging, the pair identified just under 1,300 papers published last year in predatory journals in RePEc, submitted by close to 2,800 authors. 1. In what type of non-predatory journals are these (top 5%) authors publishing papers (the difference between predatory and non-predatory can be very small)? Impact Factors? Publishers? etc. 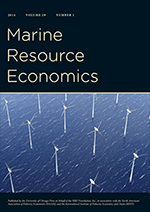 Are any of them among the top 100 journals in economics? 2. What are the institutional affiliations of [these] (top 5%) authors? Any top-ranked economics departments or business schools? 3. Where is the list of the predatory journals in which these 148 papers were published? Actually, a broad range of people submit to predatory journals. I see this study as preliminary, and I am not sure it contains strong evidence. Asked about the criteria RePEc uses to rank researchers, Wallace pointed us to this paper, which outlines the process RePEc uses to rate authors registered on the site using factors such as the number of papers, citations received, journal page counts, and views and downloads statistics. I’d blow my own horn if I was listed as a top 5% researcher. I’d include it in my annual report every year. From a worker's perspective, if you earn a good reputation at one firm --- how do you cash in on this fact with firms that don't know you have a good reputation? How do you signal your quality? In the past, an Ivy League degree or a Mensa membership card helped but in this economy --- will workers soon have a vector of crowd sourced metrics that they can display to potential employers? A future labor economist could then run hedonic wage regressions to test how the labor market rewards each of these metrics. This world already exists in academic economics. REPEC does a pretty good job of ranking us. For those at public universities, you can look up our salaries and correlate it with our REPEC rankings. You will see a very high positive correlation. Academic economics can be modeled pretty well as a perfectly competitive labor market. There is an element of crowd sourcing to REPEC rankings as citations and paper downloads are some of the metrics used to create the single index of economist "quality". REPEC provides an objective measure of who is "Royalty" in the economics profession. The current list of the top 5% is here. I am ranked #681 out of 27,365 economists so that's not bad (and my 3 books aren't counted here). Quote of the day: "...we're in the sixth mass extinction." "This is definitely human impact, we're in the sixth mass extinction. There's only been five before this and we're definitely in the sixth," WWF conservation scientist Martin Taylor told CNN." More than two thirds of the world's wildlife could be gone by the end of the decade if action isn't taken soon, a new report from the World Wildlife Fund revealed on Thursday. Since 1970, there has already been a 58% overall decline in the numbers of fish, mammals, birds and reptiles worldwide, according to the WWF's latest bi-annual Living Planet Index. If accurate, that means wildlife across the globe is vanishing at a rate of 2% a year. ...and here's a link to the full story. ...and here's a picture of a giraffe I took in Tanzania two weeks ago. On November 1st, New Jersey residents will start paying considerably higher gas taxes, with the rate rising from 14.5 to 37.5 cents per gallon (cpg) as part of a broader tax deal negotiated between Governor Chris Christie (R) and Democratic leadership in the state legislature. ... The gas tax hike is paired with a sales tax rate reduction, an increase in the earned income tax credit and the retirement tax exemption, and the phase-out of the estate tax. Right now, New Jersey has the second-lowest motor fuel tax in the nation (14.5 cpg). Only oil-rich Alaska is lower, at 12.25 cpg. In just over a week, it will have the seventh highest, just a hair under Connecticut’s 37.51 cpg. The rate, however, has the potential to fluctuate over the years, based not on gasoline costs or even inflation indexing, but rather on consumption. The law caps the revenue from the gas tax increase at the amount that 23 cents (or 12.85 percent per gallon) would have produced during the 2016 fiscal year. If consumption rises, the rate will decline slightly. If consumption falls, it will rise. Thus, the tax will bring in a consistent $1.23 billion in new revenue each year, with rates adjusting to keep collections constant. Gas taxes can be relatively good taxes, particularly when the revenue they raise is dedicated to transportation infrastructure, as the tax then represents something approaching a user-pays model. There is certainly a strong argument for funding roads and bridges using gas taxes as opposed to relying on general revenue, and, therefore, for ensuring that gas tax revenue actually flows to transportation projects. On that score, New Jersey voters will have the opportunity to decide this November whether to dedicate all money from the gas tax exclusively to transportation projects. As offsets to the gas tax increase, the recently enacted tax package also raises the amount of retirement and pension income that is excluded from income taxation. Currently, married couples filing jointly do not owe income tax on the first $20,000 a year in retirement income. This threshold is now set to increase by $20,000 a year through 2020, after which it will continue to stand at $100,000. Single taxpayers will see the exemption rise from $15,000 to $75,000 over that period. Coupled with a veterans’ exclusion, this will result in a $83 million to $113 million tax reduction in fiscal year 2018, rising to $110 million to 157 million by fiscal year 2022. The state’s earned income tax credit, which currently stands at 30 percent of the federal level, will increase to 35 percent, at a cost of $70.5 million per year by fiscal year 2022. The state sales tax, meanwhile, will decrease from 7 percent to 6.875 percent on January 1, 2017, and decline further to 6.625 percent a year thereafter, a tax cut of $655 million a year by fiscal year 2022. Last but not least, the tax reform package phases out New Jersey’s estate tax over two years, by raising the exclusion from $675,000 to $2 million as of January 1, 2017, and then repealing the estate tax outright as of January 1, 2018 (a tax cut of $562 million a year by fiscal year 2022). The state will continue to impose an inheritance tax; it is currently one of only two states to impose both an estate and an inheritance tax, which has a particularly strong adverse effect on family-owned businesses. Between fiscal years 2017 and 2022, the tax package will result in an estimated $800 million to $1 billion in additional taxes, though the tax package represents a tax cut in aggregate in the out years. In fiscal year 2017, the nonpartisan Office of Legislative Services estimates that the tax cut components of the plan will bring in $544.4 million in additional revenue, as few of the offsets will have phased in. By fiscal year 2019, the tax cut component will reduce revenues by $1.07 to $1.11 billion per year, while the increase in the gas tax will bring in $1.23 billion, for a slight revenue boost. In subsequent years, however, the cuts will be larger than the new gas tax revenue. By fiscal year 2022, the tax cuts will total an estimated $1.40 to $1.44 billion, above the consistent $1.23 billion brought in by the gas tax increase, resulting in a modest revenue reduction. By my calculations, this is actually a tax cut. Using "math" I summed the revenue changes from 2017-2022 and find that tax revenues rise by $800 million to $996 million. Overall tax revenue will become negative (i.e., a tax cut) sometime between 2026 and 2028 (later if we use a positive discount rate ... e.g., sometime between 2028 and 2032 at a 5% discount rate). The tax increase hasn’t even gone into effect yet and already, two Republican state senators have filed legislation to repeal the deal.